The Climate Change Action Group of Dufferin-Caledon would like to announce the Fast Forward 2017 Eco-Film Festival. The award winning documentaries brought to the town of Erin will now be available to the Orangeville community. The kickoff movie will be Tuesday, January 31st with the screening of “Green Rights”. As concerned citizens we accept responsibility for the living conditions of future generations and therefore assume the authority to take action to mitigate climate change. Our commitment is to showcase exceptional documentaries that highlight a variety of environmental issues. It is our hope that audience engagement will lead to support for community action. While science has shed light on the causes and ramifications of environmental problems, the gap between what we know and what we do in our day-to-day lives persists. The aim of the film series is to raise awareness, educate, and most importantly, motivate audiences to actively engage in the community. Film goers will have the opportunity to discuss, organize, and take action during an intermission and at the conclusion of each film. Space will be available for like-minded local businesses and community groups to interact with audiences at each event. The Films will be screened at Westside Secondary School at 300 Alder St, Orangeville. * Doors will open at 6:30 pm * and the film begins at 7:00 pm. Admission is free but donations are appreciated. More about our first movie: “Green Rights“ - The film showcases the dramatic, innovative legal battles going on in nations around the world. It reports on dramas in the courts and on the land, where devoted citizens and courageous lawyers take on national governments and global corporations – and win. And it asks, Why not in Canada? Why not in the US?” Sponsored by ChicàBOOM Consignment. Photo and article generously provided by Nancy Urekar. "Family Transition Place is very fortunate to have received a two year grant funded by the Ministry of Community and Social Services Violence Against Women – Rural Realities Fund. With this money we have developed a Rural Response Program which will focus on breaking down barriers to service for women who have experienced or are experiencing abuse in their relationships and reside in the rural areas of Dufferin/Caledon. One of the focuses of this program is being more “mobile” and accessible; with our new office space in Shelburne it allows us to be more central to the rural areas of North Dufferin. We will be able to deliver community education, immediate support and short term counselling to those residing in Shelburne, Grand Valley and North Dufferin, allowing us to support women as close to their home as possible. Where this is a new program we are interested in your input to help meet the community’s needs. Please take a few minutes to answer the 4 questions in the following survey monkey link," Sarah McCabe, Rural Response Councillor. When we invest in youth, great things happen!!! RBC believes in our youth and through our #make150count initiative and we are making a positive impact in communities across the nation by deepening our relationships and relevance with youth locally. Justin Besley, local student at CDDHS has been selected by RBC Shelburne as the #make150count delegate. Justin has shown exemplary community involvement through Shelburne minor sports, works part-time and is a cooperative education student at the high school. Justin could choose any opportunity to better his community with the $150 provided by RBC. After some thought, Justin opted to raise additional funds through a Noah Maritn’s pepperette fundraiser, on top of the $150 provided, to bring in Anthony McLean, “YouTuber” and speaker on January 31, 2017 at CDDHS. Anthony speaks to bullying, mental health and diversity. He has presented to 100’s of schools across the world, and has been featured on Breakfast TV, CP24 and CBC. These issues for today’s youth are directly aligned with RBC intent to raise awareness around our youth and mental health. All funds raised by Justin’s efforts will pay for the speaking engagement in which approximately 1000 local elementary students will be attending, and the remainder being donated to all local breakfast school programs. RBC Shelburne is incredibly proud of Justin and his forward approach to making change in our community! Upper Grand District School Board followed up with this media release below. inspirational speaker that will reach hundreds of local children.Centre Dufferin District High School co-op student Justin was selected by RBC Shelburne as the #Make150Count delegate.The RBC initiative, launched to celebrate Canada’s 150th anniversary, is encouraging young Canadians to do something that will make a positive impact in their communities. RBC gives selected youth $150, no strings attached, and asks them to do something great with it. Justin decided to take his $150, raise additional funds, and bring in speaker and YouTube personality Anthony McLean to speak to local children. McLean is the founder and director of iEngage and speaks to students about diversity, bullying, health and wellness. Thanks to Justin’s efforts, approximately 1,000 elementary students from schools in Shelburne will get to hear McLean speak about important issues that impact their lives. All of the funds raised will pay for the speaking arrangement, and any additional funds will be donated to local breakfast school programs. Shelburne's Royal Canadian Legion Welcomed 16 New Members into the fold with a traditional swearing in ceremony on Saturday, January 21, 2017. Click image (L) for video of ceremony. New Members include Robert A. Wilson, Walter Kolodziechuk, Greg Playford, James Harcus, Frank Linton, Paul Keefe, Carl Reed, Bea Reed, Maxwell Richardson, Oleh Stebelsky, Pam Kelly Marion Webb, Kim Hall, and Jennifer Gardner. Shelburne Home Hardware Building Centre is no stranger to supporting the Shelburne Community supporting a variety of fundraisers throughout the year. The 2nd Annual Donate A Plate Fundraiser in support of local school's Breakfast Programs brought an amazing and very helpful $12,500 ! The impact to local children is positively staggering with benefits ranging from increased concentration, improved behaviour, improved marks, to also building relationships in a safe and nourturing environment. Clearly, the benefit of a breakfast program crosses socio-economic boundaries and builds a foundation for kids to have a bright future. Photo above: (LtoR:Front) Shelburne Home Hardware's Joanne Carroll, Nicole Patton Of Primrose Elementary Parent Volunteer, Heather Verpaalen, Student Nutrition Program Manager of Food &Friends Program, Emily Darling, Teacher at Centre Dufferin District High School, carol and Bill Gillam, Owners of Shelburne Home Hardware Building Centre, Shelburne Home Hardware Floor Manager, Wendy Clarke, Principal, Hyland Heights Elementary School, Shelburne Home Hardware's Joy Vanalstine and Elizabeth Boyd. (Back LtoR) Shelburne Home Hardware's Todd Cartwright, Lori Shilvock VP at Centennial Hylands, Neil Kingdom, Child and Youth Worker for Shelburne's Local Elementary Schools and Anita MacFarlane, Community Program Director With Food & Friends Program. Shelburne Ladies Broomball Growing In Popularity! These Girls Got Game! Want To Join? Find Out How! & Some Of His Favourite Memorable Moments In 2016!
" 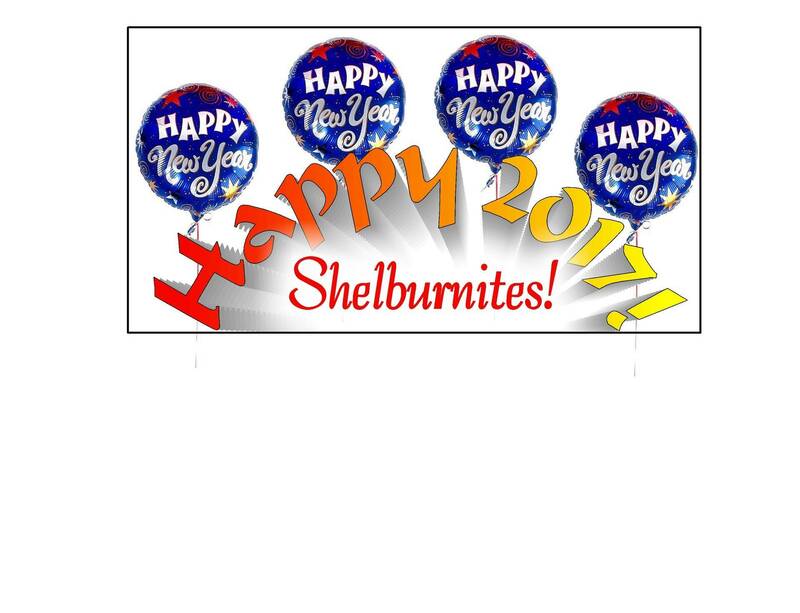 I would like to wish every resident of Shelburne, a safe and prosperous New Year. May you be blessed with good health and full hearts. Please join me as we continue to build this great Town of Shelburne, that we all call home. As I reflect on 2016, and all the initiatives that Council continues to work towards, I was asked the question "What was your favourite part of being Mayor in 2016?" As I'm sure you would agree, this is not an easy answer...but here goes.. The Town of Shelburne was blasted in March 2016 with a feverous ice storm. with our sense of community during that period. young girls, who were taken from us way too young. and offered the parents different treatment options for their children. and it all started right here in the Town of Shelburne. I'd be remiss if I didn't mention that my favourite memory of 2016 occurred when Ms. Stephanie Batchelor, (R) said 'Yes' and agreed to marry me. We'll be tying the knot on July 29, 2017.. Happy New Year Shelburne ! Shelburne Proud! Special thanks to Shelburne Mayor, Ken Bennington for taking time for The Shelburne Freelancer's exclusive feature. the old one. Improvements will continue on that intersection through 2017.
flagpoles. I look forward to many more banners in 2017.
door until someone finally answers. Shelburne Royal Canadian Legion Updates! Poor weather conditions and visibility were a factor in several of these collisions. Motorists are reminded that Road Maintenance and Plowing are working hard to open roads as soon as possible. Citizens need to be patient as roads re-open and may have to make alternate routes to get to their destinations. TEXT: Send a text to 40404 with the message "Follow @DufferinRoads"